Rachel would love to hear your dating stories! Find a Husband After 35 is a New York Times Bestseller. This book teaches a proven 15-step program to find your mate. It’s an innovative approach to the frustrating reality of being single at any age, from your 30’s to your 70’s and beyond. It’s all about taking action and moving forward, not analyzing why you’re still single, who’s to blame, and why society is the way it is. 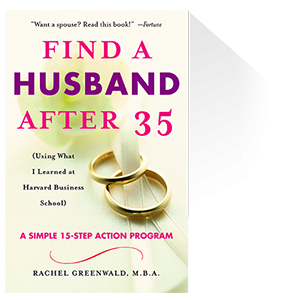 The Program described in the book is a simple 15-step process that uses classic marketing techniques which Rachel Greenwald learned at Harvard Business School and adapted to the dating world. What are the unique dating issues for women after 35 and how should you handle them? Where do you find mature single men? How do you find the good guys online? What are the small things you can do every day to meet more men? What is the most over-looked resource to find a wonderful husband? Rachel is also available to speak in person for private groups, conferences, and panel discussions. If you would like to invite Rachel to speak in person or call in to your book group, please send her a question on the Contact page of this website.